This short course is closed. Its capacity has been reached. Hands-on computer sessions will provide participants an opportunity to become familiar with the windows-based HYDRUS-1D computer software packages, including several additional modules, such as ROSETTA, HP1, UNSATCHEM, and/or the Wetlands module. Emphasis will be on preparation of input data for a variety of one- and multi-dimensional applications such as flow and transport into and through the vadose zone, infiltration from a subsurface source, and two-dimensional leachate migration through the unsaturated zone. Calibration will be discussed and demonstrated with several examples for both water flow and solute transport (using HYDRUS). Latest developments with respect to biogeochemical modeling with HP1 (HYDRUS-PHREEQC) and the large scale modeling (the HYDRUS package for MODFLOW) will also be discussed. Dr. Jirka Šimůnek is a Professor of Hydrology with the Department of Environmental Sciences of the University of California. He received an M.S. in Civil Engineering from the Czech Technical University, Prague, Czech Republic, and a Ph.D. in Water Management from the Czech Academy of Sciences, Prague. His expertise is in numerical modeling of subsurface water flow and solute transport processes, equilibrium and nonequilibrium chemical transport, multicomponent major ion chemistry, field-scale spatial variability, and inverse procedures for estimating the hydraulic properties of unsaturated porous media. He has authored and coauthored over 180 peer-reviewed publications, over 20 book chapters, and 2 books. His numeric models are used by virtually all scientists, students, and practitioners modeling water flow, chemical movement, and heat transport through variably saturated soils. Dr. Simunek is a recipient of the Soil Science Society of America’s Don and Betty Kirkham Soil Physics Award, Fellow and a past chair of the Soil Physics (S1) of SSSA, and the SSSA Fellow. He is an associate editor of Vadose Zone Hydrology, Journal of Hydrological Sciences, and Journal of Hydrology and Hydromechanics, and a past AE of Water Resources Research. Registration includes: course material, lunch, 2 daily coffee breaks, beer tasting in the university brewery (evening March 23th). Please fill the On-line Registration Form (preferred) or you can download the application form Course_Application (MS Word document), fill it and send it to Dr. Radka Kodesova. If cancellations are made before January 31, 2011, the tuition fee will be refunded. Cancellations made after January 31, 2011, will be refunded for 75% of the tuition fee. Since hotels require Credit Card information for booking, organizers cannot arrange accommodation for participant. 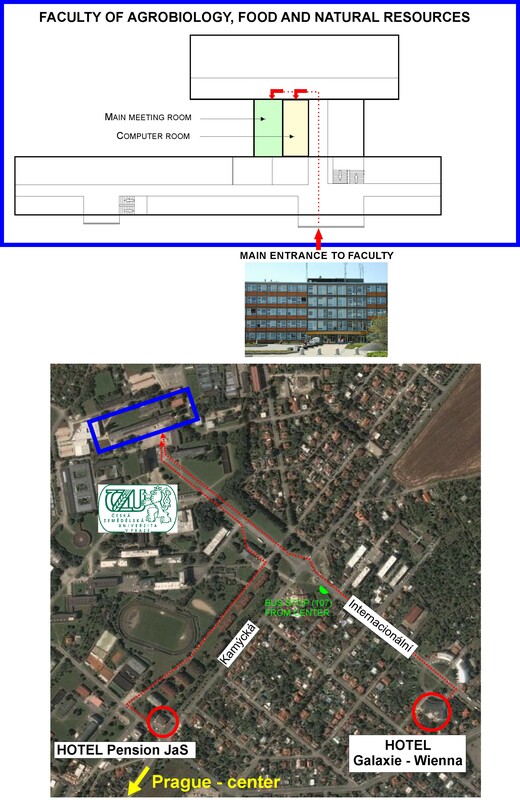 Several hotels close to the Czech University of Life Sciences are listed here. For travel to the university and recommended hotels from Prague-Ruzyne airport please Click Here.